What is mental training for sports? Sports mental training is a segment of sports psychology coaching. Mental training for sports helps athletes and team improve mental skills for competition to improve consistency in performance. 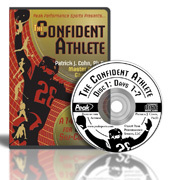 You learn how to improve and maintain confidence, focus, composure, and what’s referred to as mental toughness. Many athletes and coaches today still resist or avoid the use of mental training because they don’t understand it. In a survey of coaches, we found that more than 45% of coaches don’t understand how to use or apply mental training. Young athletes who have not been exposed to sports psychology also fall into the category. They avoid mental training because they don’t understand it. If you want to get the most out of your physical talent in sports, you want to be aware of the importance of improving your mental game. As athletes learn more about sports psychology they tend to embrace mental training in sports. So we suggest to coaches and parents that they experience its power firsthand. That’s why we offer a free 15-minute introductory consultation with athletes who are interested in mental training. Mental training for sports is about improving your performance and not life skills. You learn how to think well in competition using mental training skills. You also learn how to identify the mental barriers to success in sports – what we call limiting beliefs and expectations, such as perfectionism and social approval. But sports mental training is an educational process. We do not do therapy. You learn mental skills, just like you learn physical skills. Mental training in sports takes daily practice to improve your mental game. But you want to take it beyond practice and apply mental training to competition. Application is the key to your success with mental training. Don’t expect to read a book or do one session with a sports psychology professional and think you are mentally tough. For this reason, we offer sports psychology coaching programs starting with a one month package. How does mental training for sports work? Every mental coach or sports psychology professional is different in this respect. At Peak Performance Sports, we begin with our AMAP assessment to help identify your top challenges with the mental game. The next step is to meet with a trained mental coach and discuss your assessment. Next, we develop a mental game plan to help guide the mental training for sports program. A mental game plan helps organize the strategies in the program and provide specific mental strategies for improvement. We work through your mental game plan in the mental training for sports program. You are given specific drills and strategies to help you improve your mental game daily. We use several resources to help you improve mental toughness for sports. We provide mental edge workbooks, mental training worksheets, awareness exercises, and post-performance feedback tools to help you learn, track, monitor, and provide feedback about your mental toughness in sports. We also utilize custom mental imagery audio programs to help you apply your mental training to competition. Visit Peak Performance Sports and learn more about our sports psychology coaching programs and mental training CD products. Also, learn more about our sports psychology and mental training success stories.